The wonders of technology, it’s not perfect but it’s a long way from when I first got on the net in 1997 a lot of my friends at the time said it wouldn’t catch on,and it was too expensive. I remember going to a website in New Zealand because I could and patiently waiting for the website pictures to load… chunk.. chunk.. chunk.. as the picture finally loaded. Back then it was 386/486, I didn’t have a Pentium processor and we still had dial up.I didn’t have a laptop as they were really expensive and the idea of being mobile and accessing the internet were just well a fantasy.The laptop I’m using now isn’t a very hi-tech one, it’s the one I bought my son (with the help of Dad and Gran) for his birthday a few years ago. Though it has what I need which is great! How the hell we managed back then, I suppose we got used to what we had and accepted it. The point of this post, is I could be cleaning my house today (trust me it needs it), I’ll do it later when the sun goes down. I really love anything labour-saving, being able to listen to lots of P J Harvey without having to change a cd, the dishes washing themselves etc. I’ve been a single mother for over 20 years and I remember having a chat with both my kids and asking them what one thing would improve the quality of their lives especially related to their chores they were doing. The one thing they said and we unanimously agreed on was to buy a dishwasher ( I had a handy bonus from work) It made all the squabbling, hassle and time taken to do the dishes become totally redundant. 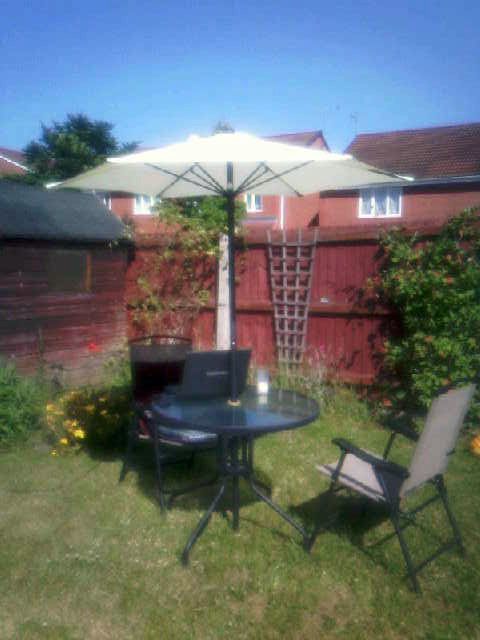 It’s kind of funny, synchronicity and all that as I’m wearing an “All Mod Cons” t-shirt as I’m sat here in the garden. I work sometimes long hours and I am quite a busy person so anything that saves me time and helps me relax I’m all for it. I could think of no better Sunday than relaxing in my garden, listening to my favourite music, our Summer’s aren’t really very long and having an extra space to relax in for a few months is great. 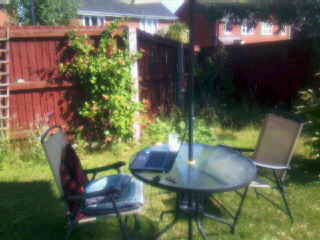 I managed to get my table and chairs on sale as I found them in August a few years ago and have looked after them. So I’m lucky I have what I need now. I’m actually on quite a few levels quite content as I don’t really need anything, of course we could all use more money, but it’s not really about that as when you are desperate about money, you tend to push it away. I don’t have much money at all, I have enough to eat and I enjoy things that don’t cost much or nothing at all (my garden, music, friendship) I am glad I have the basic things, yes I have a few toys but I won’t get myself into debt to buy more stuff. I don’t have an overdraft and live within my means and save up for things. I’m not advocating you do this, what you do with your resources is your own business, I used to worry so much about money it made me ill. I was in a mess with it, I’ve done a lot of sorting through things about that and I’m in a more balanced place. The level of contentment I have is linked to sorting things so I can have proper control of my life. I love to be of service and help to my friends and I get a lot of satisfaction being around my family and friends. I had a bit of a health scare recently and I’m going into hospital for some checks so my number one priority is to look after myself. I have looked over the last 6 months or so about what is a priority in my life what I want, need and what I don’t and by being clear on those needs and desires, it’s made my life a lot simpler for me, which brings me back to the contentment. I’m just finished working with Tom Verbroekken as he’s been a great resource for me, guiding me along my path. I’m happy to ask for help as we all need a little TLC along the way. It wasn’t an easy decision but I’m so glad I did it. I’m so used to doing that for other people in my job as an Aromatherapist and Reiki Master, in my experience people never come to see you for a Massage or Reiki Treatment, there is always other things going on.It’s also good to recognise we are not alone. I’m still up loading info to my website and enjoying blogging immensely. Today is my son’s 16th birthday and tomorrow is the Summer Solstice & Litha which is the longest day of the year here in UK. It’s like a turning point in the year. As after tomorrow it starts very slowly to getting darker again. I’m genuinely happy to be here now I have read Eckhart Tolle again and with the work with Tom Verbroekken I am starting to understand what they mean about really living in the moment. (Well there is no other time is there?) being shackled by our past or frightened of our future is not for me. I’m excited as my life is moving forward in nice ways and I’m enjoying it a lot more as before I was so worried about everything, trust me it doesn’t work – worrying that is, it doesn’t help anything. Peace is important to me, it’s like a salve for the soul, I feel I’ve come to a lot of good realisations and it is spurring me on, I may not like all the changes but I accept them. Thanks for sharing your experience about Outdoor Tables and Chairs.